There is a growing global consensus that the best way to manage funds effectively and equitably is through open budget systems. This has been strongly emphasized in the United Nation’s General Comment No. 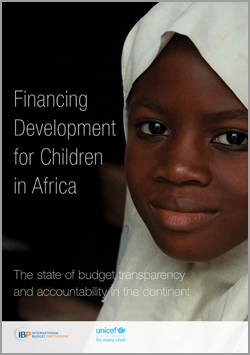 19 on Public Budgeting for the Realization of Children’s Rights and the Addis Ababa Action Agenda. There are two reasons why this message holds particular relevance for governments in Africa. First, the continent is undergoing a profound demographic shift that will see the child population grow by more than 67 percent over the next 35 years. Second, domestic resources raised and spent through government budgets now far outstrip resources provided through aid in most African countries. The future of development progress for children in Africa is likely to hinge on the ability of government to manage these domestic resources transparently and accountably.